We summarise ten years of activity working with LEGO® in HE in this short sketch. This includes our use of LEGO® SERIOUS PLAY® as academic, educational and staff developers. It also harks to how we can use the method to look at all aspects of life inside the university as well as outside it. The piece acts as a signpost to a range of other texts and resources on LEGO® in HE while also suggesting ways in which metaphorical building with bricks can move between the physical and virtual domains. Gauntlett, D. (2010). Open-Source: Introduction to LEGO® SERIOUS PLAY®. Available at http://davidgauntlett.com/wp-content/uploads/2013/04/LEGO_SERIOUS_PLAY_OpenSource_14mb.pdf. Accessed May 30, 2018. James, A. (2015). Innovative Pedagogical Practices: Innovating in the Creative Arts with LEGO. Commissioned by the Higher Education Academy. Available at https://www.heacademy.ac.uk/innovating-creative-arts-lego. Nerantzi, C. (2015, June). The Playground Model for Creative Professional Development. In C. Nerantzi & A. James (Eds. 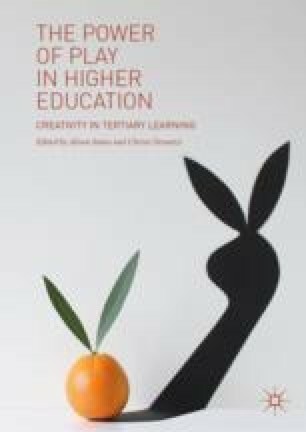 ), Exploring Play in Higher Education, Creative Academic Magazine (Issue 2A, pp. 40–50). Available at http://www.creativeacademic.uk/. Nerantzi, C., & Despard, C. (2014). Lego Models to Aid Reflection: Enhancing the Summative Assessment Experience in the Context of Professional Discussions Within Accredited Academic Development Provision. Journal of Perspectives in Applied Academic Practice, 2(2), 31–36. Edinburgh Napier University. Available at http://jpaap.napier.ac.uk/index.php/JPAAP/article/view/81. Accessed May 30, 2018. Nerantzi, C., & McCusker, S. (2014). A Taster of the LEGO® Serious Play® Method for Higher Education. OER14 Conference Proceedings. Available at http://www.medev.ac.uk/oer14/19/view/. Nerantzi, C., Moravej, H., & Johnson, F. (2015). Play Brings Openness or Using a Creative Approach to Evaluate an Undergraduate Unit and Move Forward Together. Journal of Perspectives in Applied Academic Practice, 3(2), 82–91. Available at http://jpaap.napier.ac.uk/index.php/JPAAP/article/view/141. Accessed May 30, 2018.